We’ve worked with a new partner, Perquimans County Library (part of the Pettigrew Regional Library), to share over 40 years’ worth of The Perquimans Weekly newspaper online. Published out of Hertford, N.C., The Perquimans Weekly includes news from Hertford, Belvidere, New Hope, Winfall and other local towns. Issues from 1934-1977 are now DigitalNC. Interesting issues that caught our eye include the August 26, 1938 issue, which describes the opening of a bridge spanning Albemarle Sound. There was a huge parade and celebration of “new activity, new life, new contacts” brought by the bridge. We also saw a few articles recognizing Perquimans native and Major League baseball player Jim “Catfish” Hunter, like one from October 26, 1972 covering Jimmy Hunter Day. The ongoing restoration of the Newbold-White House, which dates from 1730 and is one of the oldest historic houses in North Carolina still standing, was a multi-year project that involved fundraising and promotion. 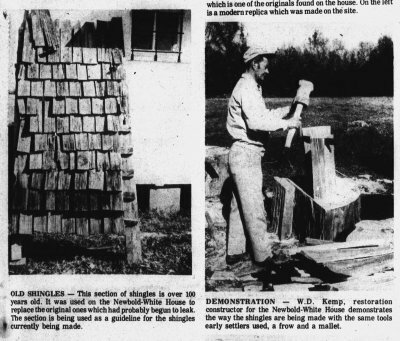 In the Weekly, we found articles describing the house’s nomination for the National Register, the local Restoration Association’s successful drive to fund its restoration, and ongoing coverage of the restoration work, including the making of the shingles. This is the first community paper nominated from the far northeast corner of the state and we hope to hear from more institutions in that area. You can search The Perquimans Weekly together with many other titles on our Newspapers collection page.